"I'm not going to put a limit on it." That was Paul Hill's reply when asked what he can achieve in his career now he is fit, firing and in favour at Franklin's Gardens. 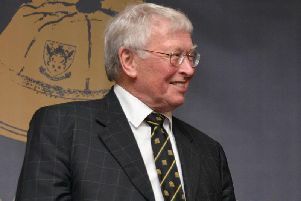 Hill made his long-awaited comeback in the Premiership Rugby Cup defeat at Gloucester on November 9. And he made his first Gallagher Premiership appearance of the season last Saturday, starting against Sale Sharks at the AJ Bell Stadium. "It's good to come back into the fold," said Hill, who was forced to have shoulder surgery during the summer. "That injury was a bit of a setback. You can never really predict those things but it's just nice to be back and playing. On his injury, which saw him miss all of pre-season and the start of the competitive campaign, Hill said: "It ended up being shoulder surgery because I had a cyst in my shoulder blade that was pushing on a nerve. "They couldn't just take it out - they had to do a full shoulder operation, but it's one of those things. "They reckon I had it for a few years. These things don't come overnight, they grow gradually and I've always been fairly weak in the gym upper body wise and I think a lot of that is because I've always had this nerve problem. "I've always been able to get by and play, but it's a relief to finally find what the cause of my problems has been. "I'm still coming back but I definitely feel I've got more strength and control of my upper body." Once touted as the best young tighthead in England, Hill's progression stalled at Saints under the previous management. He joined from Yorkshire Carnegie in 2015 and did manage to make 24 appearances during his first season at Franklin's Gardens. He made 29 during the following campaign but his number of starts decreased from eight to six. Last season, he started just five times, coming off the bench in 12 matches, as things started to turn sour. But with the change of management, Hill has renewed confidence. And he said: "I've always said that when I first came in, I never really got the opportunities to start but now the ball's in my court. "It's my chance to switch on and prove that I can be a starting tighthead, not just coming off the bench. "I'm going to do the best I can and I'm forever trying to improve what I'm doing. "I want to be someone who is a regular player for the Saints and someone who is going to have a big impact on this year. "We'll start there and then ask me in a couple of years to see how I'm doing." Hill's all-round ability was there for all to see in one memorable win last season as he played a starring role in Saints' first success against Leicester Tigers at Welford Road since 2007. He showcased his skills in open play with his agility catching the eye. "You don't want to change too much of what you bring to the table - every player has their USP (unique selling point)," said Hill when asked what he is working on in the bid to improve. "You wouldn't ever tell a player to scrap something. You need to incorporate your own game into what the coaches want from you. "The coaches realise everyone has their own skill-set and you've got to use that to the best of your ability. "I can't lose what I offer around the part to become a 100 per cent scrummaging tighthead, but equally my job is to keep developing that as I go on. "Last week was a good platform and now this week against Newcastle is going to be another test. "I need to keep proving to the coaches I'm a scrummaging tighthead as well as an outfield tighthead." Hill's belief has been boosted by some positive words from Saints supporters during his absence. He explained: "I'm not a big follower of social media but it's nice when I'm walking around the ground and people stop me to ask how far off I am from getting back playing. "It's always a really nice touch and it gives you a bit of reassurance that people want to see you back out there. "It gives you that little bit extra confidence when people say they want you back playing." And now Hill is back playing he can focus on the challenges that lie in wait on the field. Next up, it's the Premiership's basement side, Newcastle Falcons, at Franklin's Gardens. "You can't look at anyone below Sarries and Exeter who doesn't have incredibly strong individuals and big games," Hill said. "It's a massive number of teams who are really competing and you look at who Newcastle have got, players like Sinoti Sinoti, and you can't underestimate anyone."